One Not So Bored Mommy: We Are Total @GOODY Goodies In This House - WE HAVE HAIR FOR DAYS! We Are Total @GOODY Goodies In This House - WE HAVE HAIR FOR DAYS! One thing we are not lacking in this house is HAIR! We have HAIR FOR DAYS! Our vacuum cleaner is proof of that! Not only do the girls & I have fairly long hair, but even our 14 year old son has LUSCIOUS locks of curls! That means that we need lots of hair accessories to keep our hair "on fleek" and looking good & stylish. All products for this review/feature were sent free of charge by the company. I was not offered any monetary compensation by posting about these hair accessories or my honest feelings on the products. Having been raised by a hair dresser, I am pretty keen on hairstyles and making sure to take care of "OUR" hair in this house. Plus, I'm truly paranoid of HEAD LICE, so keeping my girls hair pulled back during the school day is pretty much a MUST! That also means that I am pretty choosy when it comes to the products we use as accessories. I've tried some that break the second I try to wrap the band around a second time...OUCH! I've also tried some that just simply don't work. 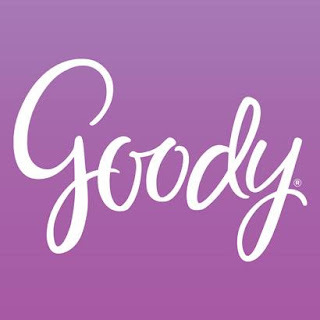 ONE BRAND that never fails to work perfectly for us is GOODY! They have a history of being consistently AWESOME with their products...at least for our family! 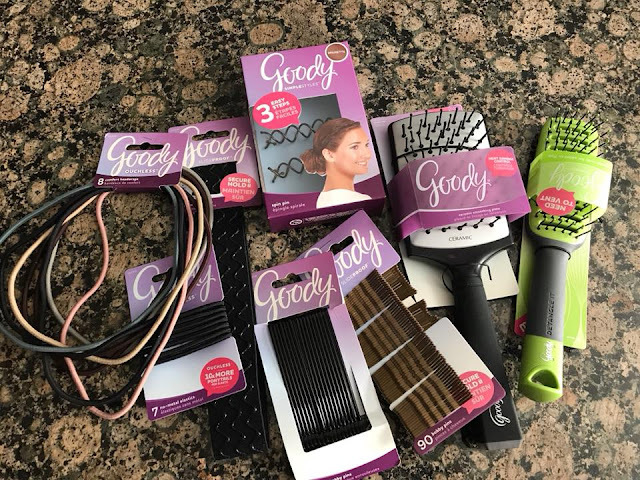 Goody sent us a few products to use, some of which we may have already had duplicates of in our "hair drawer"...because we love this brand! These products all work amazing! TRUST ME! The Ceramic Smoothing Plate Brush is the perfect MUST HAVE for my hair, when it comes to blow drying. Because my hair "tends to frizz" (naturally wavy), this brush has a plate on the inside that heats up with the heat from the dryer to grab the hair and dry from both sides. It's also a detangler style brush as well. 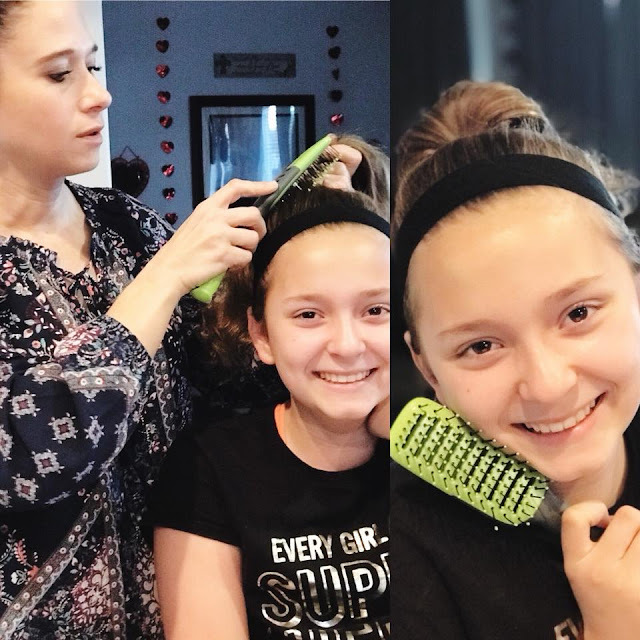 The Vented Sytler/Detangler brush is ideal for styling my girls hair in the morning's before school. 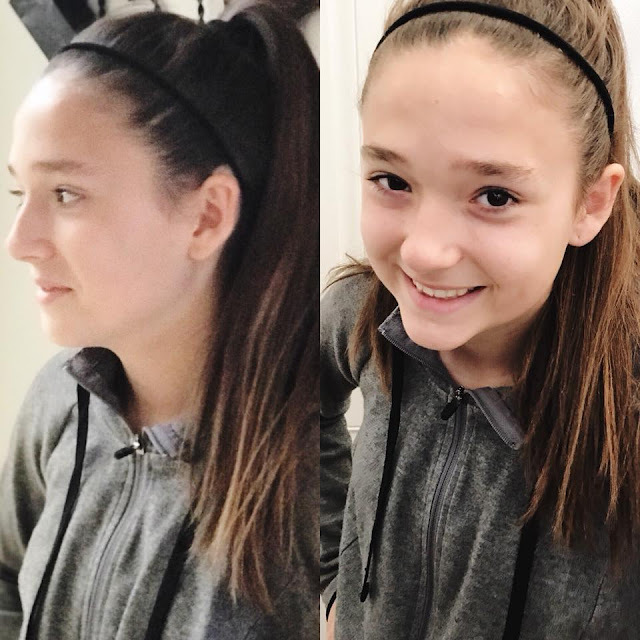 Plus, we also use the Ouchless No-Metal Elastics (because they are less likely to snap...from our experience) and can manage around a super thick ponytail to hold it in place all day. Plus, the Slideproof Silicone Headwrap gives her a cute sporty touch! The Ouchless Comfort Headwraps are my oldest daughter's favorite...because she's totally sporty, and loves to wear her hair up and out of her face. This helps keep the FLY AWAYS back too, when she's running or cheering hard. I too love the Ouchless Comfort Headwraps, because I think it adds a little "something" to an updo. 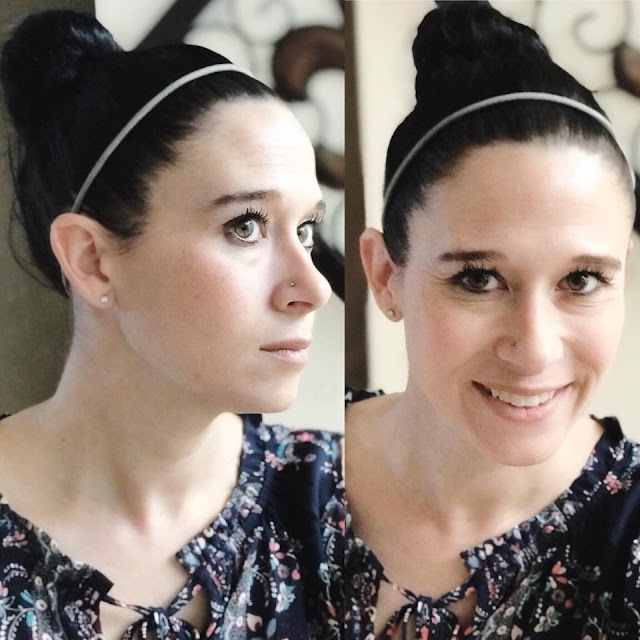 Plus, the Ouchless No-Metal Elastics and Slideproof Bobby Pins help me keep up a perfect "MOM BUN". THESE PRODUCTS ARE FANTASTIC AND I HIGHLY RECOMMEND YOU BUY GOODY BRAND for your hair and even your daughter's too. They will thank you! I mean, most of their products are called "OUCHLESS" for a reason! And you'll be going back to the store to buy more, when the elastics are missing & you can't find your bobby pins (we all know it happens). 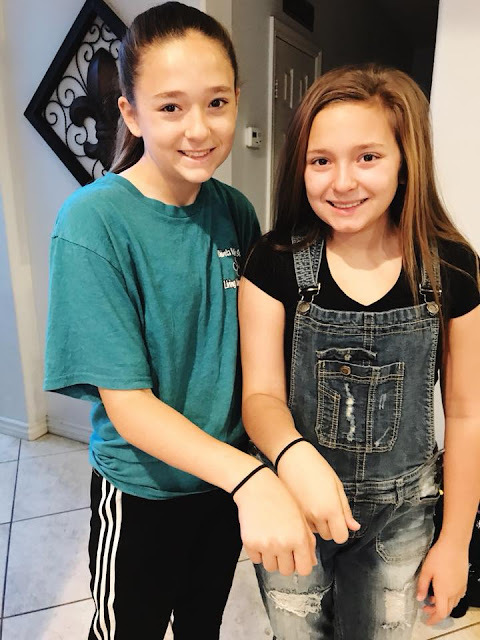 And FYI - it's always good to keep one of the No-Metal Elastics close at hand, in case you need to throw your hair up in a messy bun during the school day! 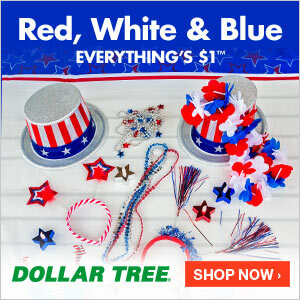 CLICK HERE to learn more about GOODY hair accessories and products.